Burnt Helmets: Oh Ya, I'm wanting to ride again! Oh Ya, I'm wanting to ride again! The thought of spring weather, sunny sky, thick cool air - just makes me buzz with excitement to do a road ride. Living in Northern Ontario our cycling season isn't short but certainly comes to a halt once the snow piles up. Much to my amazement, I have seen many a bicyclist this winter pedaling along on the sidewalks or roadways in snowy weather not fit to walk in. I'm not sure if I am simply looking for bicyclists or if more individuals are continuing to bike in the winter - for whatever reason: economy, price of gas, or fitness - which is my reason. Just not during the winter, as I don't want to ruin my equipment riding due to all the salt used on the roadways. That and my wife says I already have enough bikes (yup, three - not that I think that is enough.) so a winter beater is outta the question. For now. The first Ontario Cup race has been and gone. I finished 15th out of 20 riders, somewhat disappointing for me personally but in retrospect it was my best opening race for a season and in comparison to last year I'm starting about where I finished in terms of fitness. 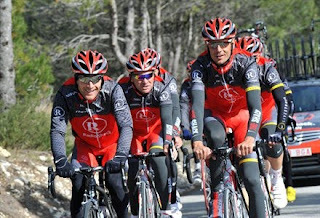 Unfortunately, the field of riders also remained about where they finished last year too. The next race is this weekend. I'm intending to try something new this race - so I'll let you know how it goes! Thanks for spending your 30 seconds with Scott!